GC ECO-INTEGRA, THE REVOLUTION HAS BEGUN! 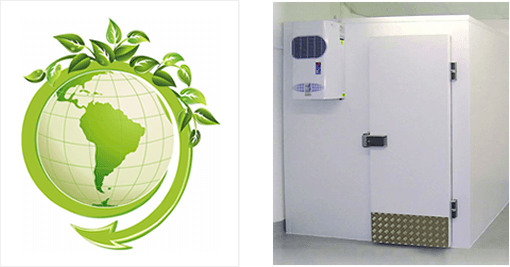 Green Cooling is proud to announce the launch of our new cold store range the ECO-Integra. With ongoing demands worldwide for the refrigeration industry to minimise the use of Flourocarbon refrigerants which have high global warming potential and are a large emitter of gases hazardous to the ozone layer. Flourocarbon refrigerants are to be phased out over the coming years, Green Cooling has the solution for you NOW. Hydrocarbon systems can offer an average of 25% energy saving over a conventional refrigeration system. R290 Hydrocarbon options have a GWP of less than 5 as opposed to R134a refrigerant, commonly used within food service refrigeration systems, which have a GWP of 1300. For low temperature applications, R404a refrigerant has a GWP of 3922. Hydrocarbon systems are 50% more efficient with regard to the conduction of heat than fluorocarbon refrigerants. This reduces the workload and wear and tear of the compressor thus extending the working life of the equipment. BREEAM compliant with No HFC refrigerant. All Systems are integral type – For ease of installation. Water cooled and air cooled options available to suite client demand. Systems come standard with leak detection to meet regularity demands. Offering an annual energy saving of up to 25% Minimizing on going operational cost. Ceiling mounted or wall mounted types enabling easy specification. Standard with LED low energy lighting. PIR Insulation offering excellent insulation properties, using pentane free blowing agents with no NOx emmissions Breeam approved. PIR insulation is approved by the Loss Prevention Council. Learn more about our different types of refrigeration technology here. Don’t forget: Green Cooling’s technicians are also experts in CO2 refrigeration. This is another natural refrigerant offering low environmental impact.